Marinate the lamb the day before. Mix the marinade ingredients together in a large bowl. 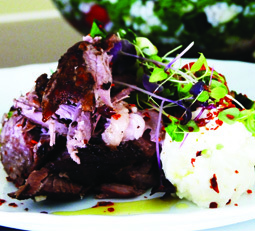 Place lamb leg in bowl and rub with marinade. Cover and refrigerate overnight. Heat oven to 200 degrees. Place lamb leg on rack above deep oven tray. Pour enough water into tray to cover the base. Cover lamb leg with foil and seal around the edges of the tray. Bake for 1 and 1/2 hours, and then reduce the oven temperature down to 110 degrees for another 4 hours. Check that the water has not boiled dry in the tray. Replenish it as necessary, keeping the foil tightly sealed. Check the lamb is tender. It should be falling off the bone. Increase oven temperature to 180 degrees and remove foil so that lamb browns and crisps for 20 minutes. Serve with fresh bread and giant tabouli salad. Bring a large pot of salted water to the boil. Add couscous and cook for 10 minutes. Remove, cool and drain into colander under running water for 1 minute. Drain completely and place in a bowl. Mix together dressing ingredients and pour over the couscous. Allow to cool to room temperature. Add the rest of the salad ingredients and toss lightly. Serve with Greek yoghurt or tzatziki and Turkish red pepper flakes (pul biber).